Escape to the enchanting beach resort town of Buzios, adored by travelers and locals alike for its tranquil beaches, popular surfing spots, and charming pousadas (luxury, historical hotels). Just 2 hours from the hustle and bustle of Rio de Janeiro, this beautiful peninsula—an outcropping north of Rio that shelters 25 fabulous beaches—is the perfect weekend getaway from the city. Buzios is more than just a beach town; it is a beach town with style. Ever since French actress Brigitte Bardot visited Buzios in the 1960s, this small whaling town has become an international attraction. It is now known for its exclusive resorts, bikini boutiques, vibrant nightlife, and secluded beaches. However, the town has managed to retain its quaint charm, and it’s just as easy to enjoy a sunset from an open-air beachside café as from a glimmering resort balcony. 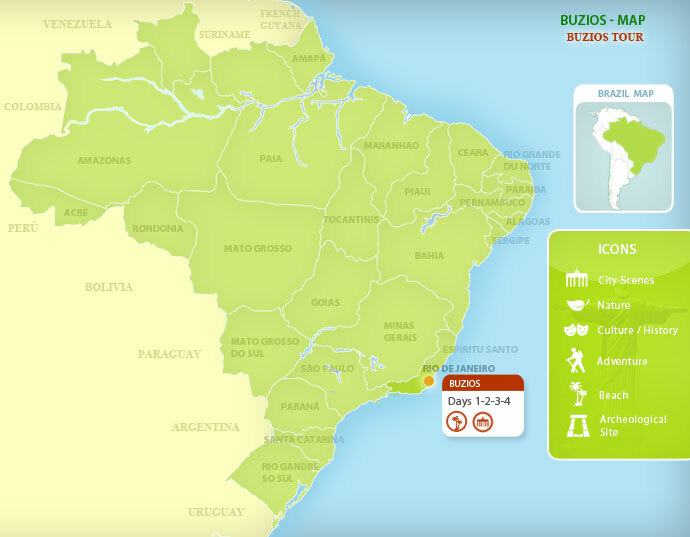 A Brazil For Less representative will meet you in Rio de Janeiro for the 2-hour drive to Buzios. Upon arrival, you’ll be taken to your confirmed hotel, where you can relax and spend the evening at your leisure, soaking up the laid-back atmosphere of this beach town. Check out our selection of excellent Buzios hotels. We recommend an evening stroll along the coast to begin to soak in the true beauty and luxury of this tropical location. Enjoy a half-day catamaran tour to some of the most beautiful beaches and islands in the Buzios area. Your guide will meet you at your hotel and take you to Porto Veleiro where you’ll board a modern and fully-equipped catamaran. The boat even features a glass floor, so you can fully appreciate the beauty of the ocean underneath your feet. On this boat tour, you’ll travel to 2 different beaches and 4 islands where you will have the chance to relax, swim, snorkel, and soak up the sun. The catamaran also features diving equipment and you’ll be provided with the opportunity to dive in 3 different locations. All the while, your English-speaking guide will tell you about the history and curiosities of the Buzios area. After the tour, you’ll return to your Buzios hotel and have the remainder of the day to spend at your leisure. Spend the day relaxing on Buzios’ beaches and strolling along the streets of this laid-back town at your own pace. Don’t miss out on the opportunity to fully experience the wonderful waters of Buzios. You can choose to lounge on the beach and watch the surf from the shore, or get adventurous and go snorkeling or scuba diving. Browse our additional Buzios tour opportunities for more suggestions on how to spend the day. We highly recommend staying an additional day in Buzios to further soak up the idyllic atmosphere, but if today is truly your last day, a Brazil For Less representative will meet you at your hotel for your transfer to Rio de Janeiro for your onward journey home or to your next Brazil vacation destination. One of the oldest hotels in the area, Casas Brancas is a stylish and delightful boutique hotel beautifully nestled on hills facing the breathtaking bay of Búzios. Elegant architecture and individually decorated rooms characterize this luxurious accommodation, all boasting a Mediterranean feel with hammocks and terraces throughout. The new relaxing spa completes this rich atmosphere. Additionally, Casa Brancas is home to Café Atlantic, one of the best restaurants in town offering Mediterranean fusion cuisine where the first-rate chef prepares traditional recipes that incorporate regional ingredients. Bucaneiro Pousada is an ideal accommodation for a romantic and relaxed gateway in Buzios. The staff’s emphasis on hospitality and attention to detail guarantee that your stay here will be one to remember. Buzios has become a popular dive destination among Brazilians. On this tour, your guide will take you to a famous spot reached by boat only, João Fernandinho. On this small island, you will encounter the most beautiful, crystal clear waters filled with plenty of corals and fish such as monkfish, jewfish, anchovies, and barracudas. This tour is designed for beginner as well as veteran divers. On board you will receive all equipment and instructions for diving while you will be accompanied by an instructor who will give you support and orientation during your dive. This Buzios tour aboard an open-air trolley car is the best introduction to this paradisiacal peninsula. The 2-hour tour visits 12 of Buzios’ most famous beaches as well as 2 belvederes, from where you will get excellent panoramic views of the town and the sea. You will also have the opportunity to stop at one of the beaches for a dip in the tropical sea. The tour includes a small snack.